The EPA warns that exposure to any of the known types of asbestos is harmful and prolonged exposure results in long-term disabilities and even death. When most people hear asbestos they automatically think of the health risks associated with exposure. However, few people are aware asbestos is a plant that grows in the wild and that the fibers are still being used to manufacture products in the United States and around the world. Asbestos is found in several forms throughout the world. Historians are not aware of where the name originally came from, but they believe it may have come from the Greek word, “sasbestos,” meaning unquenchable or inextinguishable. One of the key properties of asbestos is its ability to provide exceptional insulation. Archeologists have found asbestos dating back to the Stone Age. That means asbestos has been growing on the planet for more than 750,000. 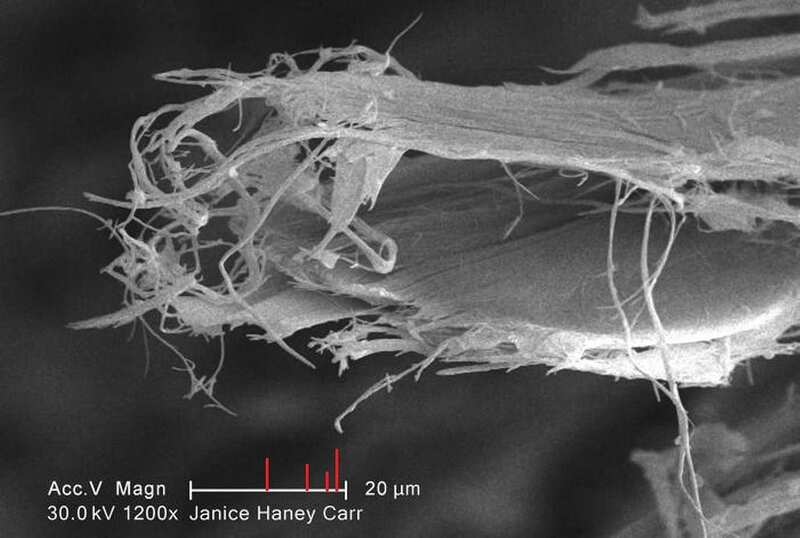 Various forms of the silicate fiber are found in plants throughout the world. There are six types of asbestos recognized by the EPA. All of the six types fall into two categories, serpentine and amphibole asbestos. Below there are descriptions of the six types of asbestos. Chrystotile is the most common form of asbestos. Manufacturers used this form to make brake lining, gaskets, roof tiles, floor tiles, boiler seals, and pipe, duct, and appliance insulation for businesses and homes. 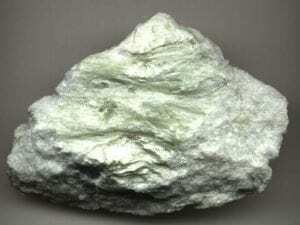 Chystolite is often referred to as “white asbestos,” and it is categorized as serpentine asbestos. 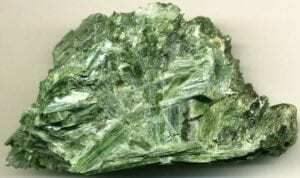 Chrystolite is the only asbestos used in manufactured products today. Distinctive crocidolite is the most dangerous asbestos. The blue straight fibers are recognizable. The hazardous building additive is found throughout Australia, Bolivia, and South Africa in steam engine insulation, cement pipes, insulation, and spray-on coatings where it was used freely. Researchers believe tremolite causes autoimmune diseases like lupus, psoriasis, rheumatoid arthritis, and others. Less is known about whether autoimmune diseases are an early sign of mesothelioma or other asbestos-related diseases. Tremolite is found in an array of hues from transparent to opaque. An amphibole, usually gray, off-white, or brown. 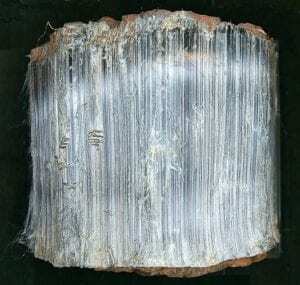 Anthophyllite fibers are like chains. Or, sometimes found in a pear cluster with streaks of gray. A more rare form found primarily in Finland. Actinolite asbestos is green. The depth of color depends on the iron content in the specimen. This form was never commercially used, but it is found in other products that are contaminate by it. Do you need more information on asbestos? Contact a knowledgeable Green Ready professional to discuss your asbestos maintenance needs. Asbestos is a highly-regulated fiber that is known for having unmatched insulation properties and for causing irreversible damage and disease from exposure. So, the Environmental Protection Agency and other state and federal regulatory agencies have passed laws to manage the use and maintenance of asbestos and asbestos-containing materials (ACM). There are many great resources that offer valuable information about the industry. Below is a list of important documents you may find interesting. The Asbestos Hazard Emergency Act, also known as AHERA, is the EPA’s response to growing health concerns associated with asbestos exposure. The act gives vital information regarding the use and maintenance of ACM in public buildings and schools. The EPA’s AHERA Designated Person’s Guide gives all of the information needed to properly maintain ACM in public and for-profit schools in the United States. The requirements for managing ACM and schools is very different than the management of ACM in other buildings. So, this document is extremely important. The EPA’s Asbestos Fact Book contains important information including safety guidelines, maintenance best practices, action plans, worker protection standards, and more. Read the Asbestos Fact Book for information on regional EPA contacts, information materials, and a glossary of related terms. Maintaining asbestos-containing materials in schools is very different than it is in other public buildings. This publication by the EPA gives important information for maintaining asbestos-containing materials in public and for-profit schools across the United States. These are just a few of the many documents published by private and government agencies. If you have questions, contact Green Ready, Inc. to speak to a knowledgeable professional. Children suffering from lead poisoning often exhibit signs of behavioral, mental, and physical disabilities. Unfortunately, there is no way to know if lead exposure is affecting you or someone you love without having tests done to confirm the presence of lead. If you need a test consultant, check out the Green Ready, Inc. business directory to find an EPA-licensed consultant near you. 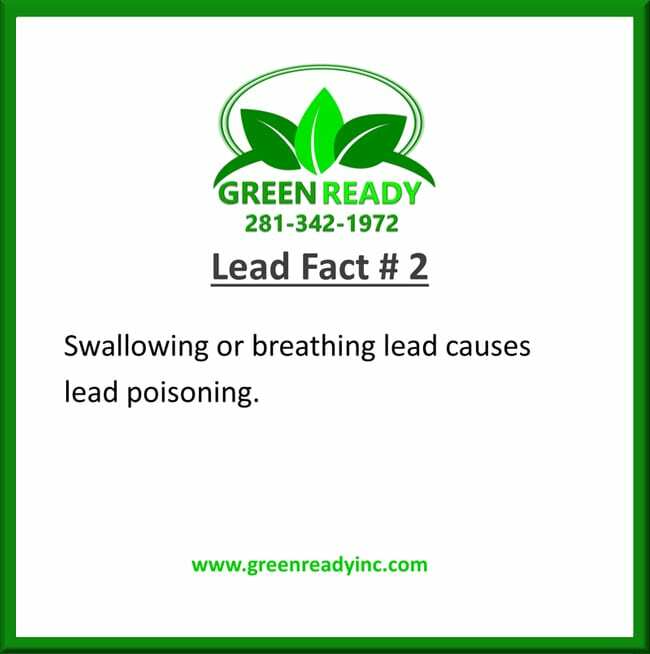 Inhaling or swallowing lead paint causes lead poisoning. No amount of lead exposure is safe. Even touching surfaces painted with lead paint causes unhealthy levels of heavy metals. This means toddlers and small children are at the highest risk for exposure. 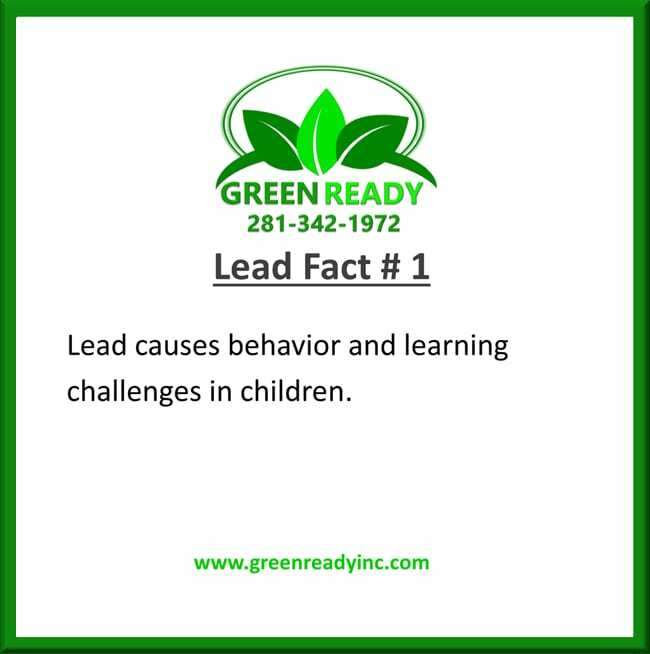 The effects of lead poisoning include behavior and learning disabilities. However, washing your hands regularly and wiping down surfaces painted with lead paint reduces the risk of exposure. Locate lead in your home and eliminate them. The above infographic tells you where you are likely to find lead in your home. 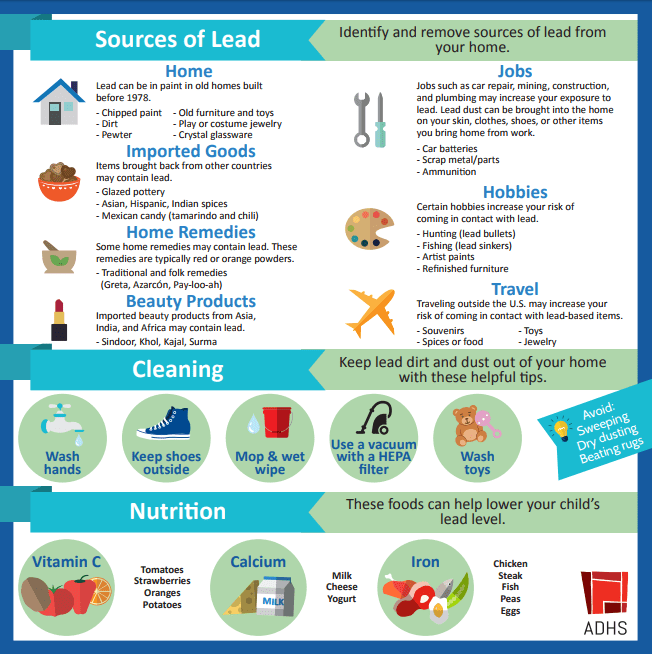 Furthermore, it provides great information about cleaning your home to prevent the spread of lead. It also gives information about lowering lead levels by eating a well-balanced diet.